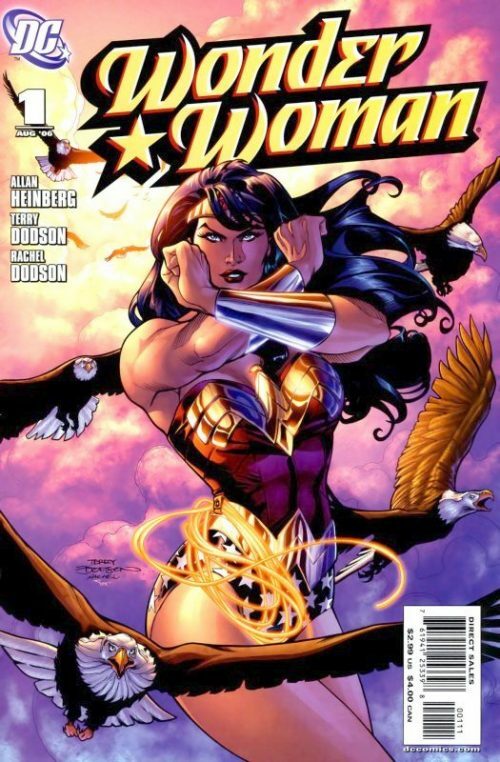 This issue sees Gail Simone bring us a decidedly”Red Sonja”-esque flavour to the Amazing Amazon’s exploits. 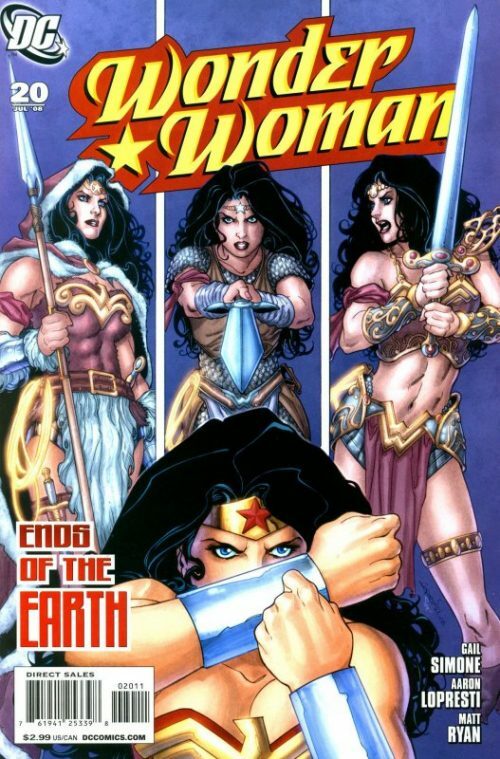 Ironically, several years later Simone would in fact become the regular writer for a while on ‘Dynamite Entertainment’s’ Red Sonja monthly title. This issue also marks the debut of new regular artist Aaron Lopresti. 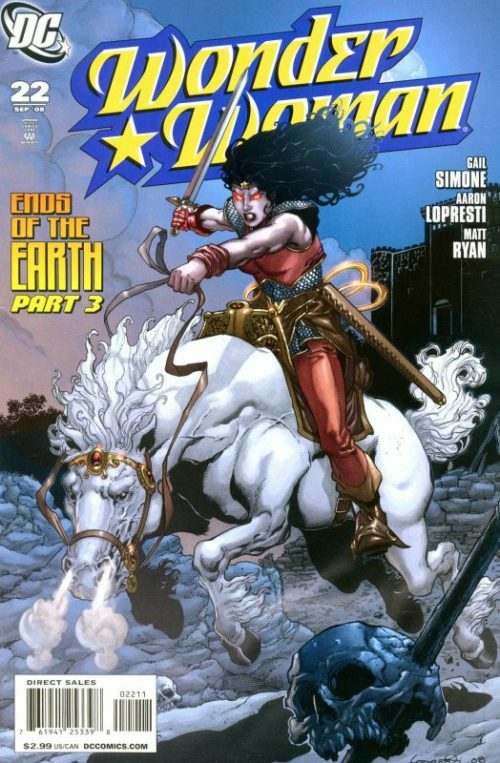 Wonder Woman, dressed in a variation of her traditional ceremonial armour, traipses through a snow covered landscape. She sense she is being followed by a hungry pack of wolves and prepares herself for their attack. As they pounce she parries their jaws, not wanting to kill them. She unhooks her lasso and ensnaring them, orders the starving animals to sleep. She sense their agony and fear and drawing her sword, puts them out of their misery – shedding a tear as she does. Six hours previously at the Department of Meta Human Affairs Diana, in her Agent Prince guise, is sitting in Sarge Steel’s office. Her boss asks her if she is nervous and she calmly says “no”. He wonders why that is – especially as anxiety would be a perfectly normal human reaction in these circumstances. He then asks her how she had managed to survive an attack by Captain Nazi and live through the detonation of a sizeable amount of C4 explosive? She again calmly replies “Training, skill and luck Director. Another time I might not be so fortunate.” He then tells her that he is going to promote her to a senior field agent! She will assemble a team of six under her command from a selection of prospects he has cherry picked himself. “Choose wisely. Your life depends on it”. With that he ushers her out of his office and slams the door behind her, leaving a bewildered Diana standing in the corridor wondering what has just happened. As she looks at the file of potential recruits Etta grabs her arm and leads her to the canteen where they can talk. Etta asks what Sarge Steel had to say to her and Diana tells her friend that he had promoted her. Etta thinks that this is great news but Diana is not so sure. She feels he is jousting with her and keeping her off guard. “It’s a warrior’s tactic, not a reward for achievement. Etta replies that Diana might be right but she might also be feeling paranoid. 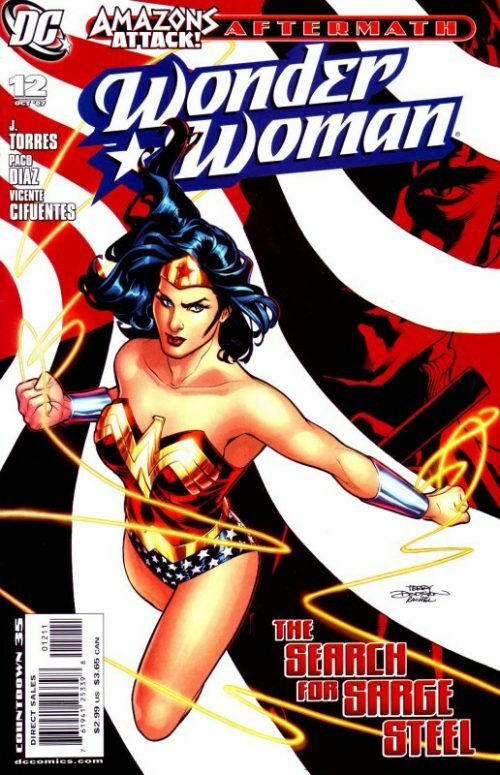 She suggests using the lasso on him but Diana feels that it is too heavy handed an approach. As they finish lunch and leave the canteen Diana is then asked by Etta why she had taken the job here at the Department of Meta Human affairs in the first place? Diana replies that she in the past had felt a disconnectedness…a feeling of removal. She wanted to know society in Man’s World but it has been harder than she had first imagined it would be. 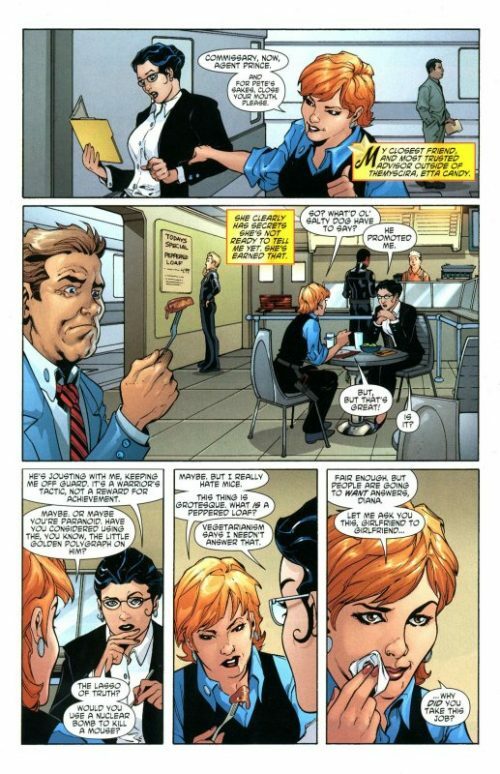 As they enter Diana’s office however they find a stranger sitting on her desk. Etta immediately recognises him as the same man who she had discovered in Diana’s apartment a few weeks ago. She quickly draws her gun and but he produces a sword and slices through the barrel. He squares up to her saying that he could kill her for that insolence. 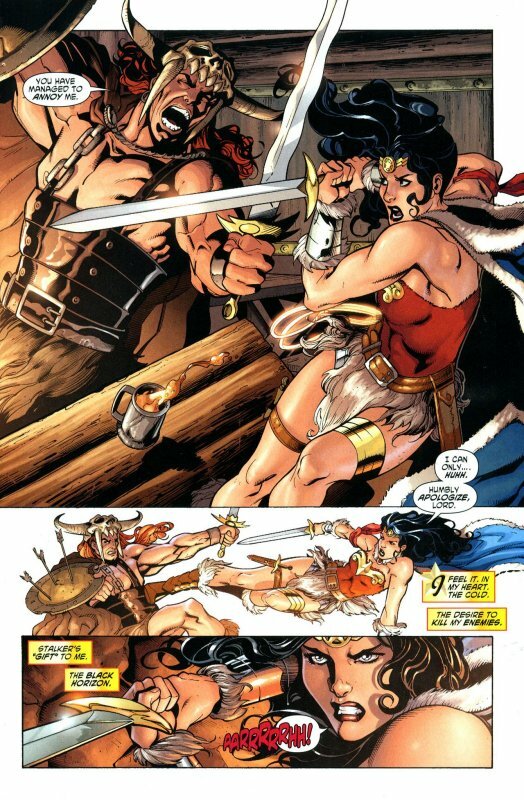 Diana intervenes by grabbing his arm and slamming him against the wall face first, before disarming him. As she looks down where he kneels he says that he will be needing the sword back. She smiles back “Finders, Keepers, Mr…?”. He replies that he has no name but some call him Stalker. A worried Etta demands to know what he has done to her while inside Diana’s mind, the Amazon Princess sees blackness and realises that Stalker has no soul. 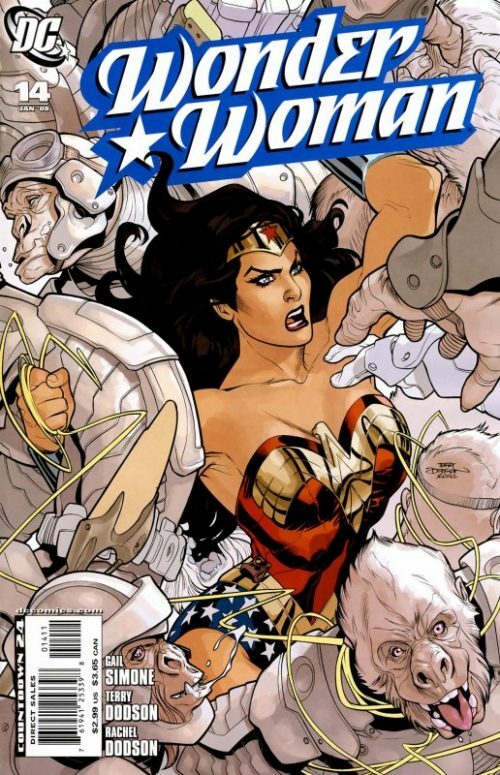 As Etta squares up to him, ordering him to release Wonder Woman from her strange trance he refuses, saying she is lost and lost she may remain. As Etta eyes the lasso still joining them he suggests unhooking the rope would be unwise and could do Wonder Woman some evil. Etta grabs the rope anyway and calls to her friend. 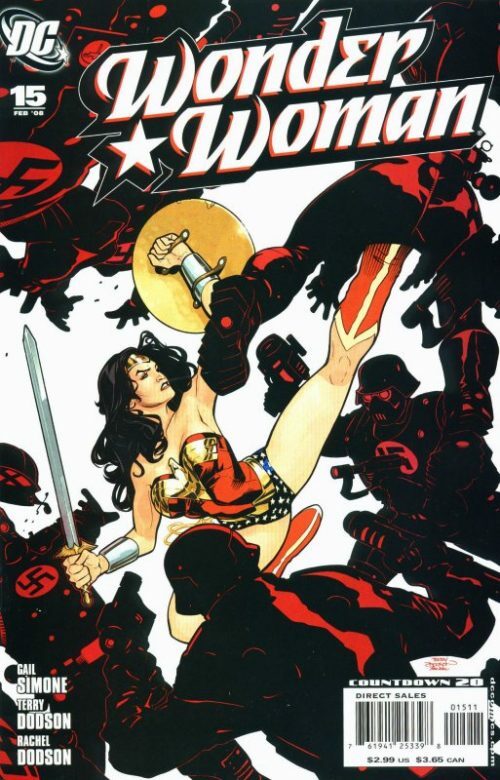 Floating in a sea of blackness, Wonder Woman discovers that Stalker has lived untold ages with no love or joy. In fact he has forgotten the value of such things. No being has suffered so, not in history. Poor, pitiful, wretched presence. It is too much. Indescribable. Endless. “I feel it. A whisper of what it means to be him. Like my heart bleeds out all reason to live. The horizon…the black horizon…” Just then she hears Etta’s voice in the gloom and feels the arms of her friend wrap around her as Wonder Woman whispers “Do you feel the bitter cold? I don’t think I will ever be warm again, Etta”. Back in the tavern Beowulf confronts Diana, raging that he has come far and fought many, including seeing his own nephew roasted and eaten by a serpent. What does Diana know of suffering? She casually replies “I’d say it went a bit worse for your nephew.” An enraged Beowulf draws his sword and Diana swiftly raises her own to parry his strike. She kicks him away and prepares to defend herself against another lunge. Beowulf seems impressed by her skills but nevertheless slaps her across the face. She in turn punches him directly in the nose,, causing blood to pour from it. Beowulf pauses and tells Diana to stand down, as he sees now he had mistaken her abilities. He also does not fight women. She asks whether he ever fights beside women though? 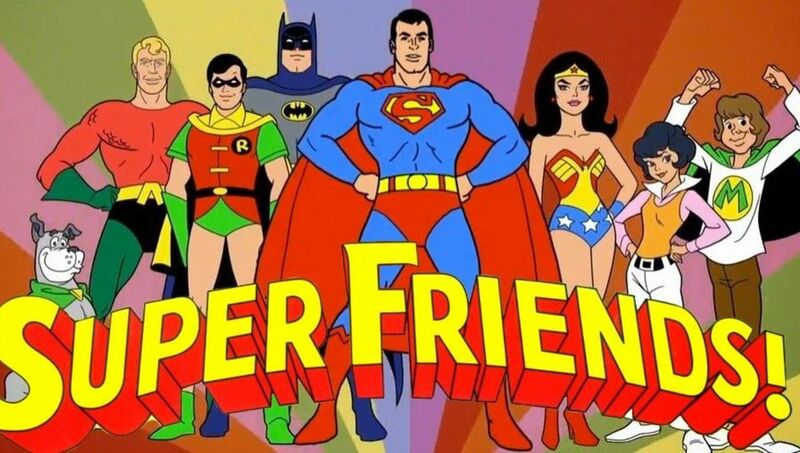 Back at the department of Meta Human Affairs Etta has managed to unhook the lasso and moved Wonder Woman onto a couch, where she still lies eyes wide open and trancelike. Etta asks what is wrong with the Amazon Princess and Stalker tells her that this is how it had to happen and that he had no choice. “Her compassion made her…unable to complete the job at hand.” he tells Etta. 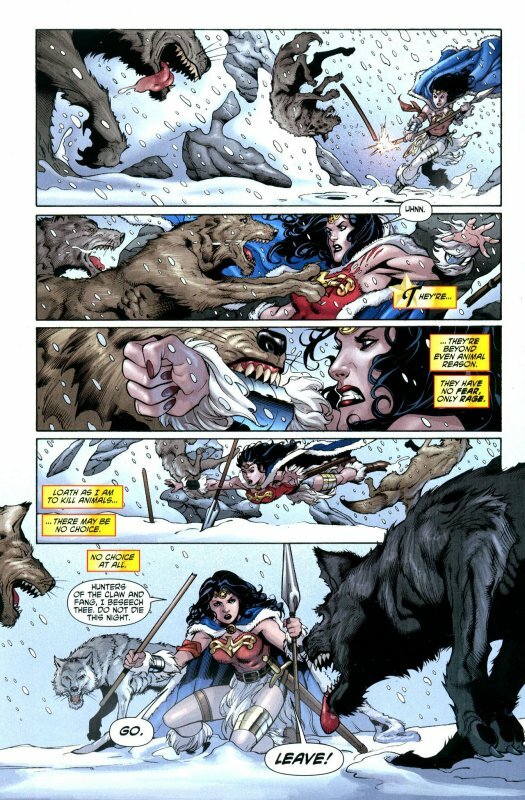 As she tries to stir Wonder Woman from her zombie state she demands to know from Stalker what it is he expects Diana to do? He replies that there is someone he needs her to kill. On his world this someone is known as D’Grth. Here though, he is known as…the Devil!